Erosion at the piston crown is visible. In extreme cases, there are seizure marks all along and around the piston. There is a hole in the piston. 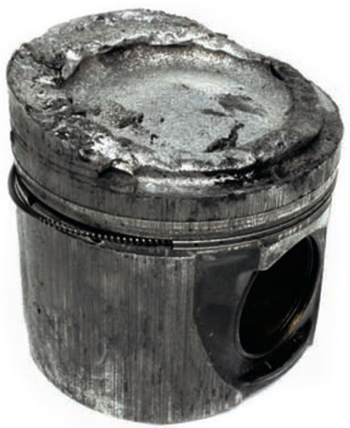 This damage is attributed to the thermal overload of the piston. There are two causes for this. The bowl edge has been "gnawed off." The injection nozzles display a poor spray pattern. The injection pressure and the delivery rate of the injection nozzles are set incorrectly. The top land shows seizure marks in the piston pin axis. Melted piston crown on top of a diesel piston. The air supply is reduced, e.g. the air filter is clogged. The fuel delivery is set incorrectly. The start of fuel delivery is set incorrectly. The nozzle needle is either wedged or stiff. The exhaust gas system is clogged. The incorrect fuel or fuel with an insufficient cetane rating is being used, or there is gasoline in the diesel. The valves are leaky, resulting in compression loss. The air pre-warming is defective (especially for very low ambient temperatures). The combustion bowl is not damaged. An excellent spray pattern can be observed at the top of the piston. The cooling oil nozzle is either bent, has become detached or has not been assembled (assembly error). The time between oil changes is too long. In this case, there is a risk of polymerization of the engine oil, especially when using biofuels, such as rapeseed and soybean oil, which can result in the cooling oil nozzles being clogged. Contamination, such as gasket residue, etc., prevents the required circulation in the oil circuit. Set the injection amount and timing according to the manufacturer's specifications. Check the injection nozzles for any leaks, the injection pressure and the spray pattern. Pay attention to correct alignment when assembling the cooling oil nozzles. Thoroughly clean the oil channels in the engine block, the crankshaft and the cylinder head. Make sure the pressure-regulating valve is functioning correctly. Ensure that the time between oil changes is much shorter when running the engine on biofuels. Causes of High Oil Consumption"